Since last Tuesday John and I have been following this tragic fire that has broken out on the slopes of Haleakala... of our new island home. Our house is on the other side of the mountain and is in no danger. The fire is in POLIPOLI SPRING STATE RECREATION AREA, a forrest of giant redwoods and eucalyptus and many more tree and plants. 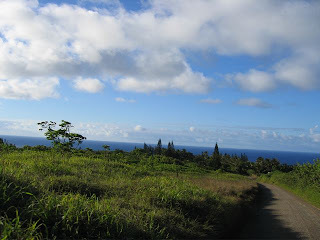 This is the first place we went hiking on our very first trip to Maui in 2001. Now in its eigth day, the fire on state forest reserve land increased to 2,291 acres in perimeter. The cause of the fire is still undetermined. DLNR officials suspect an illegal campfire at the upper Waiohuli trail may have ignited the forest fire. SO SAD. We received this image and note from our realtor on Maui this morning. the poor forest is largely demolished, at this point. Haleakala (and all it inhabitants including the precious wildlife and native fauna). 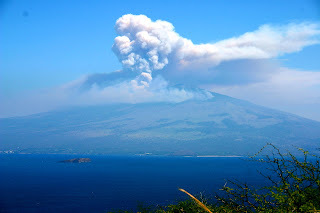 Youʻll see a column on the right for civil defense matters, and the fire is the first link. They seem to update this page once or twice a day. They also offer a phone number for recorded information at the bottom of the fire link page. 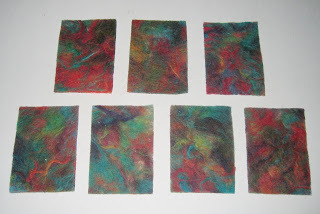 For this month's ATC (Art Trading Card) I decided to try and use up some yarn scraps. The theme was color my wprld so iused all sorts of colored yarns to make a felt panel that I cut into the appropriate size. It's quite simple actually as documented below. I have documented the process with a very small portion since I did not think to document it until after I was finished with the large. Materials: wool yarn scraps and a wire brush. These are small yarn scraps from a few different tye-dyed yars that i had but never really liked. What I do is run the wire brush over the small pieces on top of a cutting board until the yarn has been shredded apart. You can buy the wool already "carded" as it's called but this is a good way to use up scraps. This is what you will end up with after the scraps have been brushed. In order to get a 1/4" thick panel, you will need to start out with a pile og carded wool about 4"high. Next you place the wool into a tray or large baking dish and pour very hot water with about 1/4 teaspoon of dish washing liquid in it over the top. Then "work" the fibers of the wool together by pressing up and down on the wool creating bubbles. It is very important to work fast before the water cools. The hot water and the motion along with the bubbles force the fibers to meld together. Do not over work or you could end up with holes or thin spots. I still don't really understand how it works. Once you have completed working the wool, roll it up and remove from tray and run it under cold water to shrink the fibers...almost like shocking the fibers. The hot water expands the fibers and the cold water shrinks them quickly. You can repeat the process of hot and cold several times depending upon how tight you want the panel. On the second round of hot water, just place itt back in the tray and pour hot water over without working it. Next, place the panel on a towel and roll the water out of it. Here I am just pressing the water out for illustration's sake. Allow to dry thoroughly before cutting or sewing. You can also press with a hot iron while wet to further the shrinking process. The final ATC cards. Pretty cool that the entire process (excluding dry time) took about 2 hours. If you used carded wool, it would go much faster. This is a close-up of December's ATC, Sound of Music is the theme. I sketched this kooky contraption in my sketch book a while back and i just thought that it visually represented an animated musical suite in my mind. I imagine that this machine runs with with some sort of fancy dancy syncopation. We created them by cutting out all the shapes from sticky Pantone color overlays using an xacto knife. Conn helped out. These are the January ATC's that we just sent out. The theme is Color My World. At first I wanted to do a stylized map of green and blue textures. That wasn't successful. Then I turned to a box of Martha Stewart paint swatches. I always liked the striped color combinations and with my penchant for interior decor (Conn is laughing) coupled with a recent clip I'd seen of Martha extolling the virtues of versatile paint over permanent wallpaper I thought them a fitting example of coloring ones world. I also like the high-falutin' names they give these colors like, sandstone and beach glass, so I used the names as criteria in choosing which color swatches to use. Only those whose names referenced vaguely Hawaiian things made the cut. Throw some vellum in the printer and voilá! We have been packing and tossing stuff for a few weeks now and this past Sunday we dropped our old computers and electronics off at the Union Square Electronic Waste Recycling Drop-Off Event by Lower East Side Ecology Center. It was sort of sad to see the old iMac go, but it had been in storage for 3 years. It is just insane to me that these machines become obsolete after a few short years considering how much they cost. But we felt good in dropping them off to be recycled, because discarded computers and electronics are toxic hazardous waste! In addition to being the most toxic components of the waste stream, e-waste is also the fastest growing one. It is estimated that by the end of 2006, some 163,420 computers and T.V. 's became obsolete in the US... EVERYDAY! It is estimated that 315 million computers will become obsolete in the United States and that they contain a total of more than 1.2 billion pounds of lead. About 40% of the heavy metals in landfills - including lead, mercury and cadmium - come from discarded electronic equipment. The negative health effects of lead are well known, but also consider this: just 1/70th of a teaspoon of mercury can contaminate 20 acres of a lake, making the fish unfit to eat. Please drop all your electronics off to be recycled...you get a tax deduction to boot! HAPPY NEW YEAR... AND WHAT A YEAR IT WILL BE! As John alluded in his previous post, we have some REALLY BIG NEWS to share with you all. Some of you already know, but for those who don't... CUCKOO FOR COCONUTS will be relocating. Yes, we have decided that it is time to leave New York City for the warm tropical breezes of Maui! 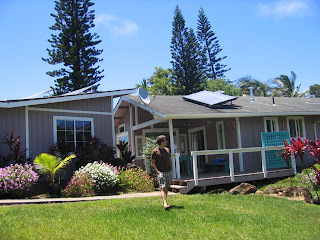 We bought a house on Maui late summer of 2006 and look to be moving sometime in the next few months. Are we crazy? NO! What are we going to do when we get there? TAKE IT ONE DAY AT A TIME! 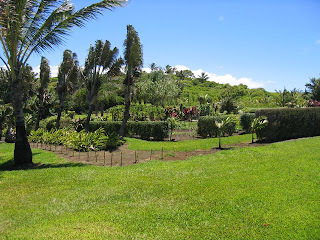 Eat fresh fruit from our yard... coconut (of course), banana, guava, papaya, orange, mango, tangerine, starfruit and many more. Our first goal will be to get the garden planted. 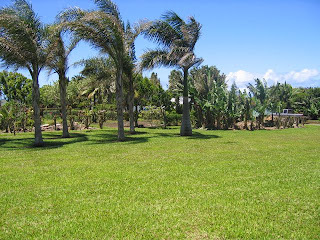 Here is a sneak peek at our 2.1 acres of PARADISE. Stay tuned and check back often for all the details of our journey. Oh yeah, we hope to see many of our friends in our new home so make your reservations early! We are actually getting bookings already. The view from the drive down our road. The cluster of cook island pine trees in the center of the image is our yard. John taking a stroll through the front yard. 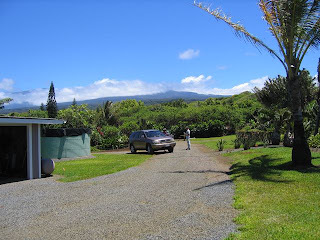 The view of Haleakala from the back of the house. In the morning's and evenings you can see to the 10,023 foot summit of the dormant volcanic crater. The view from the back of the house to the vegtable garden and back yard. The view from the far corner of the backyard looking toward the house through the palms and banana grove.